“Dream Child” is a fine blend of interesting and deep compositions within great songs. The album took 15 months to complete with Mattsson taking great care to arrange and record very precisely with many ideas being reworked during this process to bring you the album you hear today. 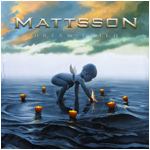 The material on “Dream Child” is better structured and more accessible than before and with the inclusion of strings and woodwinds (courtesy of The Astral Orchestra) along with better recording and mixing techniques all show how Mattsson applies the musical influences he has gathered since day one making Mattsson in 2008 a unique experience. On his new vocalist, Mattsson proudly states, “Adrienn Antal is the best singer I have ever had the pleasure of working with. She has a great voice, is very musical and we click together extremely well. Adrienn Antal is the star of this album. Without her the songs would not have come to life in the way they have, and in my view the main quality boost comes from Adrienn Antal”. Adding further depth to the vocal arrangements are the inclusion of vocals from Björn Lodin (Baltimoore) who will be a name familiar to fans of numerous albums from Lars over the years. Lars Eric Mattsson - Guitars, bass, keyboards and voices. Adrienn Antal - Lead and backing vocals. Björn Lodin - Additional vocals.